Marketers know that FOMO is a core experience in people's lives and leveraging data to attenuate it, they go for the jugular. Marketing is a science that thrives on the application of the understanding of human behavior. With the availability of copious amount of data at the easy reach of marketers, it’s easy to subject consumers to the fear of missing out (FOMO) purchases. Marketing has evolved into targeting consumers to discover the way the rationalize, think, learn, behave, and make decisions. Access to your data, understanding human psychology, and the principles that drive your interactions with brands everyday prime you up for a successful FOMO purchase. The Information Commissioner’s inquiry into political digital marketing, following the Cambridge Analytica data scandal, revealed that there is a form of data brokerage going on. The brokers collect data from hundreds of sources, including census information, surveys, public records, and loyalty card programs and then sell that information to other organizations. Data is growing faster than ever before and by the year 2020, about 1.7 megabytes of new information will be created every second for every human being on the planet. And with Data Science, you can be effectively and with precision constituted into a segment based on a variety of factors such as your consumption pattern, search history, purchase lifecycle, and social media behavior. This, in turn, will make you a surefire target audience. According to a survey carried out on 1,200 Canadians by a PR firm Citizens Relations on the impact of FOMO, 64 percent said they experienced the phenomenon, 56 percent of whom were between the ages of 18 and 30. This survey shows that although FOMO impacts decision-making for everyone, it’s especially prevalent among millennials. The major factor that brings on this feeling is the fear of losing social relevance or not being seen as “in the groove,” according to 24 percent of millennials that have experienced FOMO. Marketing has been able to catch in on this feeling especially with the availability of data. You are potentially boxed into a corner, having used your data to play on your sensibilities, building the crescendo until you get to your threshold level and then capitulate. How are marketers able to achieve this feat? Here are some tips on steps they embark upon by utilizing your data to create FOMO to accelerate results from your marketing initiatives. Marketers know fully well that consumers have some intrinsic things in common, they, therefore, use the process of segregating and aggregating to discover these factors based on the data at hand. The next thing is to segment consumers into homogenous groups. Since FOMO is basically driven by social pressure, demonstrating demand compounds the pressure to purchase. The available demographic information about you definitely shows which social media accounts you use regularly. Customized messages are smartly crafted for you through the media. They may border on how many people have viewed a particular product you are interested in and even the fact that it’s in short supply, amazingly jolting your degree of interest and demand on the product. This, in turn, shores up your “I don’t want to lose this product feeling,” with the consequent result of ordering the purchase probably online and very quickly for the fear of missing out on the product. Mashable reports that 56 percent of social media users are afraid of missing something such as event, news, and important status update if they don’t keep an eye on their social networks. Since you too may have previously experienced FOMO, you will quickly grab the opportunity to acquire this special or unique product or service. You will even be “buoyed” by the fact that you are experiencing a product before others get to know about it on the social media. Brands know the importance and propensity of making something feel special and essential. Once the opportunity rears its head, they don’t allow the chance to go begging. Marketers know that people tend to share their accomplishments on the social media and therefore, the hype on this to create competition. Since they are in possession of your information, targeted messages can be sent to you and others in your homogenous group to heighten the pressure that must have been built on you especially when you must have been nursing FOMO. 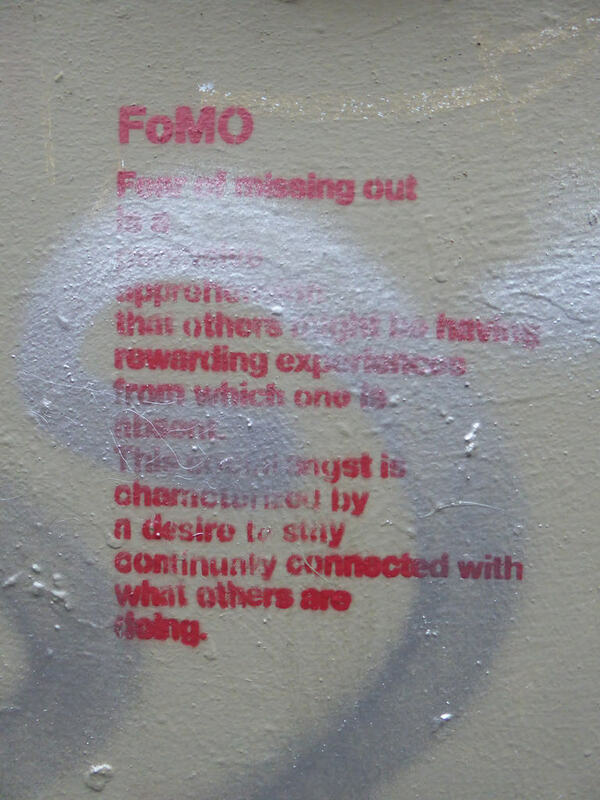 FOMO is a core experience in people’s lives and leveraging data to attenuate it is a masterstroke.